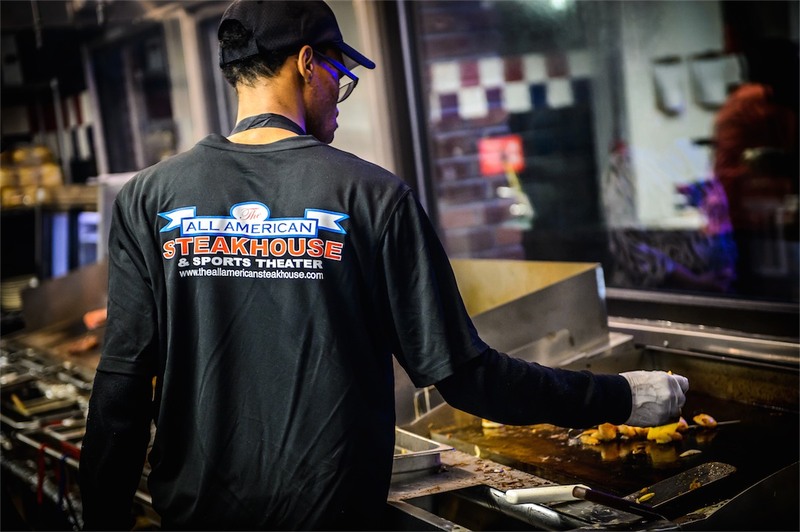 JOIN THE ALL AMERICAN STEAKHOUSE-A RESTAURANT BRAND POISED FOR GROWTH! The All American concept is not only what the consumer is looking for, it’s what they are craving—great quality food with signature steaks in a sports-themed restaurant; good, old-fashioned, friendly service; and a fun and energetic atmosphere. 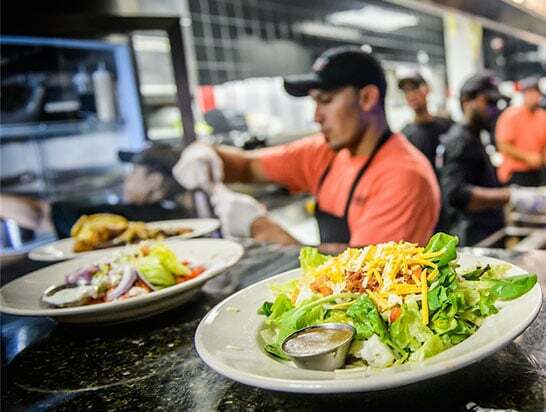 The All American Steakhouse & Sports Theater is positioned to accelerate its growth. Our first location opened in November 2003, and we now have five affiliate stores with two franchise locations as of February 2017. We are currently in search of individuals qualified to own and operate this fun, exciting, and financially rewarding business. We firmly believe that our concept will be popular and successful anywhere in the world. Each restaurant has an in-house butcher whose sole responsibility is to make sure that our steaks are aged and cut to our critical specifications. While most steakhouses pay a third party to cut their steaks and ship to their restaurants in cryovac packaging, we buy our beef in bulk. Our meat company only purchases beef from Midwestern farms raising grain-fed cattle. The beef is held in their facility in a temperature- and humidity-controlled room and aged for 45 to 70 days. The beef is then shipped to our stores where it is only accepted by the butcher or kitchen manager. All butchers have their own meat room and walk-in refrigerator where they cut and dry the aged steaks. The ambience of the restaurant creates a fun, exciting, and energetic atmosphere. With over 20 high-definition televisions throughout the dining room, waiting area, and patio, plus up to 10 6-foot by 10-foot high-definition projection screens, the true sports fan can always catch their favorite game. We even have a jukebox so guests can play their favorite music while dining at The All American Steakhouse & Sports Theater. We only use the freshest ingredients in our proven, made-from-scratch recipes. Our beef comes from Midwest suppliers who only market beef from grain-fed cattle. No other casual dining steakhouse combines an aging process as extensive as ours with in-house butchers that hand-cut all steaks. Our steaks are grilled over mesquite wood so that we can provide our guests with the most flavorful and tender cuts of beef. Our philosophy and our company’s foundation have been built on honesty. We believe this begins with our being honest with our team members. Our team members know exactly how they are performing based on constructive feedback. We care as much about the personal development of our staff as we do about how they perform inside our restaurants. We treat our vendors with honesty, with a high level of integrity, and with equal measures of loyalty. By providing quality food at a good value and with friendly service, we deliver an excellent dining experience for our guests. Because we are loyal to our staff and treat them with respect, they give the same to our guests and treat them like family. By not always basing every decision on profit but instead on what is best for our guests and best for our staff, we believe the bottom line will also benefit. At All American Steakhouse, we are strong believers in giving back to our community. Each one of our restaurants is committed to in-store fundraisers for organizations in their communities including churches, schools, community centers, and many other local charitable organizations. We believe in providing our team members with a fun, professional, rewarding, and safe working environment. Every individual is given the same opportunity to grow within our organization, from hourly employees all the way up to multi-unit managers. We believe in diversity, in treating people with kindness, and in understanding—all with an emphasis on having fun. The All American Steakhouse & Sports Theater is a company that is positioned to do great things, and we are delighted that you are along for the ride. 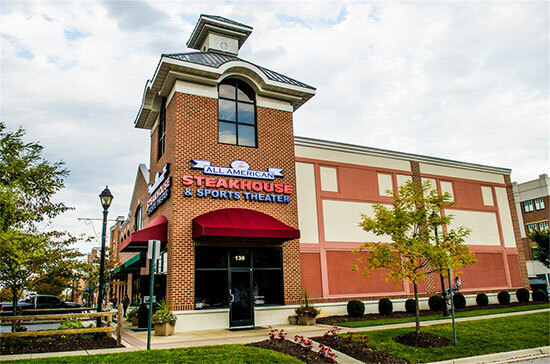 As a unique casual dining steakhouse, the All American Steakhouse & Sports Theater has achieved notoriety, respect, and market share. Our potential is limited only by the creativity of our management and the vision of our owners. Our future in this “growth” industry is flourishing, and we welcome you! Single and multi-unit territories available. Potential franchise operators should have a total net worth of $1.5 million with liquid assets of $350,000. Prior restaurant or food service is strongly preferred.